Academy of Ancient Music/Choir of the AAM/Richard Egarr (harpsichord). 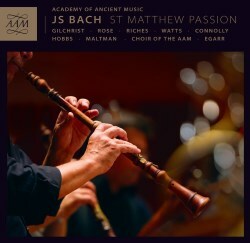 Last year I reviewed a recording of the St John Passion directed by Richard Egarr and involving many of the same artists that take part in this new recording. Despite some reservations I found much to admire in the performance so I was keen to hear Egarr’s account of the St. Matthew Passion. This new recording was made almost exactly a year after Egarr set down the St John and the same venue was used. There are two changes to the solo team with Thomas Hobbs and Christopher Maltman replacing Andrew Kennedy and Christopher Purves respectively. When he recorded the St John Passion Richard Egarr used Bach’s original 1724 version and here, too, he’s gone back to Bach’s original score, using the 1727 version of the St. Matthew as opposed to the rather more familiar 1736 version. There are a number of subtle differences between the two scores and I noticed a number of minor variations in solo vocal lines when following in my Bärenreiter score; none of these is particularly significant. There are some more major points of difference, however, which Egarr summarises in a note in the booklet. One is evident right at the start. You won’t hear a ripieno choir singing ‘O Lamm Gottes unschuldig’; that was an addition in 1736 whereas in 1727 the chorale melody was played on the organ and woodwinds. Another significant change is heard at the end of Part I. The marvellous chorus, ‘O Mensch, bewein dein Sünde groß’, with which Bach closed Part I in 1736 is absent; in its stead we hear a much simpler chorale. At the start of Part II the aria, ‘Ach , nun ist mein Jesus hin’, which is given to the alto in the 1736 version is here sung by a bass: while one regrets a lost opportunity to hear more of Sarah Connolly the fine singing of Christopher Maltman affords ample compensation. Later in Part II there’s a significant change to the great bass aria ‘Komm, süßes Kreuz’. Instead of hearing the obbligato played on the viola da gamba (1736 version) the 1727 score has the part played on a lute. I’ll discuss the ramifications of this change when considering Christopher Maltman’s overall contribution. The other important difference between the two versions is that in 1727 Bach used one set of continuo players whereas in 1736 each of the two choirs was furnished with its own continuo. The logical thing to do on this recording, therefore, was to place the continuo team centre stage. That’s absolutely the right thing to do but the slight snag is that the two choirs are not as spatially separated compared with what one can experience on recordings of the 1736 score. When I reviewed Egarr’s St John Passion the comparisons I made were with Sir John Eliot Gardiner’s 2003 recording (SDG). As I don’t have another recording of the 1727 St. Matthew in my collection I was obliged to turn for comparisons this time to a recording of the 1736 score. I could have used Gardiner’s excellent 1988 DG Archiv recording but I decided it would be preferable not to compare Egarr with the same conductor again. So, instead, I turned to Philippe Herreweghe and opted for the second of his two Harmonia Mundi recordings, made in 1998. With Herreweghe one gets an enhanced separation between the two choirs as compared to Egarr and I think the benefits of this are significant in the movements where the twin choruses have clearly differentiated, often antiphonal parts. All of Egarr’s principal soloists are excellent. Elizabeth Watts offers some lovely singing in ‘Blute nur’. I liked very much her next contribution: she’s highly expressive in the recitativo ‘Wiewohl mein Herz in Tränen schwimmt’ while in the aria that follows, ‘Ich will dir mein Herze schenken’ she retains the expressiveness but also displays the necessary vocal agility. Predictably, Sarah Connolly makes a distinguished contribution. Her singing in ‘Buß und Reu’ gives great pleasure and she makes ‘Erbarme dich’ one of the emotional peaks of the entire Passion; in the latter she’s partnered by a fine violinist who I assume is Pavlo Beznosiuk. The change of male soloists from the previous recording has brought no weakness. Thomas Hobbs sings the tenor arias very well indeed. Particularly impressive is his account of the taxing aria ‘Geduld, Geduld!’ He negotiates the solo very well and manages the not inconsiderable feat of singing expressively despite the cruel demands of the vocal line. Christopher Maltman is simply marvellous, bringing all the subtlety of a Lieder singer to his music. ‘Komm, süßes Kreuz’ works very well indeed in its earlier scoring. In the booklet Egarr refers to the ‘somewhat tortured effect’ of the gamba that was used in the 1736 scoring. I think he’s right to point out that the instrument emphasises the physical effort of carrying the cross. I’d also add that the gamba sounds more overtly emotional. However, the aria refers to ‘süßes Kreuz’ (my italics) and the word ‘süßes’ correctly translates as ‘sweet’ in the booklet. (The translation in the Bärenreiter score is ‘blessed’, which makes the same point, I think.) The use of a lute with its delicate timbre emphasises the “sweetness” of redemption through the Cross. It also gives an intimacy to the music and also, in my view, seems to internalise the emotions. The lighter textures enable and encourage Maltman to deliver the aria gently and expressively. Herreweghe uses a gamba. Perhaps that explains why his speed is a fraction steadier than Egarr’s. His soloist, Dietrich Henschel, excellent though he is, doesn’t match the mellifluous intimacy of Maltman. Here I prefer the 1727 version. Matthew Rose and Ashley Riches are convincing in the roles of Jesus and Pilate respectively, singing and pacing their recitatives intelligently. James Gilchrist is the Evangelist and he’s ideally cast. He offers the full range of emotions from biting drama in the Judgement Hall scenes through to deeply felt sorrow as he describes the death of Christ. As I listened I marvelled at how a singer of this class can take the bare material of ‘mere’ notes printed on the page and, through colouring, pacing and expert enunciation of and care for the words, transform that base material into compelling and moving music. As was the case with the recording of the St John Passion the choral and orchestral contributions are very fine. Each of the two choirs numbers 10 singers (3/2/2/3) and they don’t put a foot wrong. They can meet every one of Egarr’s demands, including his requirements for agility or biting drama. The Academy of Ancient Music plays with collective distinction and there’s some admirable obbligato playing. Despite all this vocal and instrumental excellence there’s one thing that makes me very thoughtful about giving a strong recommendation of this set. I’m afraid the potential drawback is the direction of Richard Egarr. Much of what he does is excellent but on several occasions I found his tempo selection distracting. In reviewing the St John Passion I commented that a good number of the chorales seemed too fast – at least for my taste – and just recently I heard most of the broadcast in which he conducted the same work from the Amsterdam Concertgebouw in the traditional Palm Sunday performance which evidenced the same trait. Here, in the St. Matthew he is often disconcertingly brisk in the chorales. That’s the case with the very first one, ‘’Herzliebster Jesu, was hast du verbrochen’. An immediate comparison with Herreweghe revealed that in his performance the music is just fractionally slower and, as a result, it sounds properly thoughtful though there’s no question of the chorale dragging. I could give other examples where it seems to me that the speed for an individual chorale is faster than the words and the overall sentiment warrants. Not all the chorales are treated in this way but sufficient of them are as to raise a question mark. Some of Egarr’s other speeds caused my eyebrows to rise. The opening chorus of Part I proceeds at quite a lively pace – just too lively for my taste. I certainly don’t want to hear a ponderous speed but here the music seems to lack gravitas. Furthermore, when the central section of the chorus is reached (3:56) Egarr speeds up slightly; I don’t know what the justification for this is. I turned to Herreweghe and found that his speed, though by no means slow, is just that bit steadier and it just feels right. There’s not a vast difference – Herreweghe reaches the central section in 4:18 – but it’s enough for me to have a definite preference for a Herreweghe-like speed. Nor is this the only questionable tempo decision. In the 6/4 recitativo where Christ institutes the Eucharist (‘Trinket alle daraus’) the music is surely pressed too hard. Frankly, Egarr’s pacing makes the moment seem matter-of-fact whereas Herreweghe is just a bit steadier and so he’s infinitely more satisfactory. Later in Part I there’s a decided oddity in the tenor recitativo ‘O Schmerz’.The solo passages are fine but every time the chorus interjects Egarr speeds up. I have no idea why this is done – I’ve never heard anyone else treat it in this way – and the effect is destabilising. Herreweghe adopts a consistent tempo and is much more convincing. There are choral interjections also in the aria ‘Ich will bei meinem Jesu wachen’ which follows on immediately. Consistency would suggest that these interjections ought also to be speeded up but Egarr maintains the same speed. It’s most odd. Some listeners may also have a problem with little tempo nudges in which Egarr indulges from time to time for expressive effect. Some of these don’t bother me – for example in ‘Erbarme dich’ - but one example is not remotely to my taste. In ‘Buß und Reu’ Egarr keeps holding back the tempo to allow more expression in the obbligato flute parts. This happens across the bar line between bars 5 and 6 and again as bar 7 gives way to bar 8. This happens throughout the aria and it’s most distracting. Herreweghe keeps the speed constant but gets his flautists just to lean on the tied note across the bar line – as do most conductors in my experience: nothing more is needed because Bach has written the expression into the notes I’m not for a moment suggesting that period performances should be devoid of expression – far from it – but this little device is as surprising as it is affected. As I said, for much of the time I like Richard Egarr’s direction but I do have some doubts too and it’s for this reason that my enthusiasm for this expertly sung and played recording of Bach’s great masterpiece has to be qualified. As was the case with the previous release of St John Passion the recorded sound is excellent and the documentation, including essays by the conductor and by Stephen Rose is excellent; the booklet is beautifully presented.